Stalker mentioned the five Wisconsin natives that were a part of that team, and talked about the monument series. Thanks were given to the Brewers for their efforts in helping preserve baseball history, and to all those that made the monument possible. Those that contributed to the monument were invited to join Schlesinger and Stalker for proper acknowledgement. The group consisted of, Dale and Jeff Wetzel (father and son Brewer season ticket holders since the teams move from Seattle) Dan Wackman (grandson of 1901 Brewer Bert â€œPeteâ€ Husting) and Archie Monuments. Acknowledged but unable to attend was Jim Kluge (grandson of former player Wattie â€œRoscoeâ€ Holm). 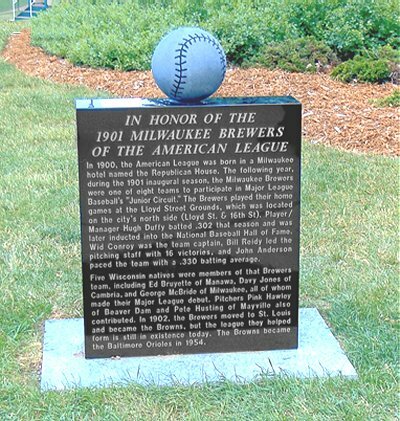 Along with the 1901 Brewers, this monument tells about the American League forming in a Milwaukee hotel room, and five Wisconsin natives that were fortunate enough to play major league ball in front of admiring fans in their home state. Well-known names such as Charles Comisky, Connie Mack and American League president Ban Johnson met with Brothers Matt and Henry Killilea at the Republican House in 1900 and established the league. The inaugural season of the AL began in 1901 and Milwaukee was awarded the Brewers. 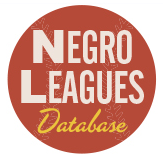 The new league gave an opportunity for a couple hundred more players to play major league baseball. Wisconsin had much talent to offer the majors during the early years of the league. Bruyette was born in Manawa, WI on August 31. Baseball sources say the year was 1874, but his obituary from the Wenatchee Daily World states he passed away at the age of 60, in 1879. Ed made his major league debut on August 6, 1901 with the Milwaukee Brewers. He played in 26 games mainly as an outfielder, but also filled in at second base, first base and shortstop. According to his obituary, he played with Seattle in the Northwest League, and was player-captain with the Butte, Montana team. He organized and kept active in the Fruit Growers Association. For a number of years he was a grading foreman in a packing plant. Ed died of a heart attack while tending the sprayer in his orchard on August 5, 1940, in Peshastin, Washington. Hawley was born in Beaver Dam, Wisconsin on December 5, 1872. The veteran pitcher ended his ten-year major league career in Milwaukee. He brought much experience to the young Milwaukee club. Hawley was known as a real workhorse pitcher. He Pitched 300 or more innings for 6 seasons, with a league leading 444 innings in 1895 for Pittsburgh. During his stay in Pittsburgh, he was named â€œThe Duke of Pittsburghâ€. He chalked up winning seasons of 31, 22 and 27 wins. With Milwaukee, he had a record of 7 wins and 14 losses, and an era of 4.59. After the 1901 season, Pink played for the American Association Milwaukee Brewers, managed at La Crosse and Oshkosh. While with La Crosse, he coached Ed Konetchy before his major league career. Pink returned to Beaver Dam and managed the La Sonia bowling alleys. Hawley is buried with his family at Oakwood Cemetery in Beaver Dam. Pink had a brother named Blue that played baseball, Blue caught for his brother at Wayland Academy in Beaver Dam. There is a story told that Pink and Blue were twins and they received their names at birth, when the hospital tied colored ribbons to the boys to tell them apart. However, their grave markers list Emerson P. Hawleyâ€™s birth in 1872 and Elmer B. Hawleyâ€™s birth in 1873. I believe Hawley certainly desires a spot in the Wisconsin Athletic Hall of Fame. I am currently planning a memorial for Mr. Hawley in Beaver Dam for early part of 2010. Jones was born in Cambria, Wisconsin on June 30, 1880. He got his start with the 1901 Milwaukee team on September 15. Davy made his presence known with three home runs in 14 games played. When Milwaukee lost their team to St Louis after one season, Davy played for St. Louis in 15 games before he joined the Cubs to finish the season. During his 14-year major league career, he also played for Detroit, Chicago AL and Pittsburgh of the Federal League. Jones was a member of the 1907, 1908 and 1909 AL Champion Detroit Tigers. Jones played in the outfield with Hall of Fame players Ty Cobb and Sam Crawford. He formed friendships with them that lasted a lifetime. Davy remained in Detroit for a number of years and operated his own chain of drug stores. He returned to Wisconsin and lived in Milwaukee, before spending his final years in Mankato, Minnesota. Davy was elected to the Wisconsin Athletic Hall of Fame in 1964. In 2006, he was honored in his hometown of Cambria, Wisconsin. With financial help from the Jones family, and time donated from Jay Williams and Phil Slinger planning a dedication, Jones became the second player honored in Stalkerâ€™s Deadball Monument Series. Husting pitched 8 innings in 1900 for Pittsburgh and joined Milwaukee for his first full season of 1901. In 1902, he played in one game with Boston of the AL, and finished the season with a 14 and 5 record for the AL Champion Philadelphia team. Hustingâ€™s friendship with Connie Mack lasted a lifetime. McBride was born in Milwaukee on November 20, 1888 he also got his start with the 1901 Brewers making his debut on September 12, filling in for Wid Conroy. After a brief stay with Pittsburgh in 1905, George finished the season with St. Louis. He played one more year with the Cardinals and then played thirteen years with the Washington Senators. As a shortstop, he was great, leading the American League in fielding average five years. McBride was elected into the Wisconsin Athletic Hall of Fame in 1952. McBride passed away in Milwaukee at the age of 92, after enjoying a long healthy life. He drove his automobile six months prior to his death, without the need of eyeglasses. Georgeâ€™s hobbies included bowling, golfing and taking walks to the Elks Club several times a week. He is buried next to his wife Anne at Holy Cross Cemetery, Milwaukee WI. The 1901 Brewer monument is two sided. One side contains the text, and the reverse side lists all the members of the team and those that donated towards the memorial, as shown below. 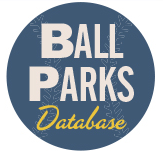 were one of eight teams to participate in Major League Baseballâ€™s â€œJunior Circuit.â€ The Brewers played their home games at Lloyd Street Grounds, which was located on the cityâ€™s north side (Lloyd St. & 16th St.). Player / Manager Hugh Duffy batted .302 that season and was later inducted into the National Baseball Hall of Fame. Wid Conroy was the team captain, Bill Reidy led the pitching staff with 16 victories, and John Anderson paced the team with a.330 batting average. Five Wisconsin natives were members of that Brewers team, including Ed Bruyette of Manawa, Davy Jones of Cambria and George McBride of Milwaukee, all of whom made their Major League debut. 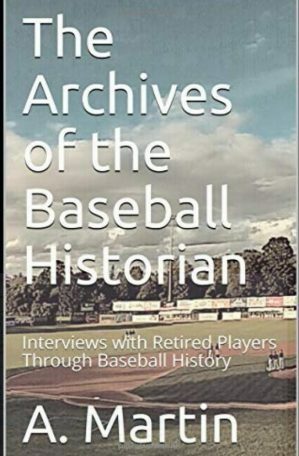 Pitchers Pink Hawley of Beaver Dam and Pete Husting of Mayville also contributed. In 1902, the Brewers moved to St.Louis and became the Browns, but the league they helped form is still in existence today. The Browns became the Baltimore Orioles in 1954. 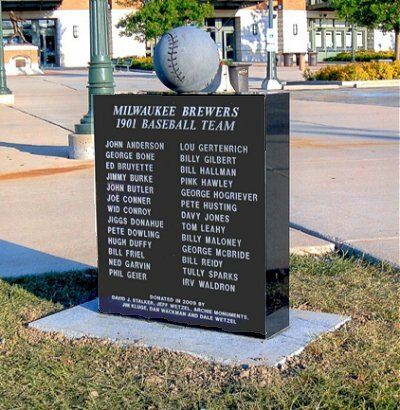 In this Deadball Monument Series the 1901 Milwaukee Brewers join players, Fred Merkle, Davy Jones, Billy Sullivan, Addie Joss, Pete â€œRedâ€ Kleinow, Charley Faust, Bob Groom, Pete Husting, Bill Killefer and Wade Killefer. 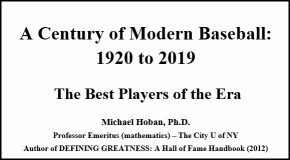 For those interested in adding a player, team or ballpark to this series, or financially contributing towards this series, please do contact me. Can you tell me where I might find a copy of the 1901 Milwaukee Brewer team photo? ?